One of the highlights of our Christmas Bird Count was the large number of Pine Grosbeaks we saw. I took all the photos for this blog entry on the actual day of our Christmas Count, Sat. 12/15. 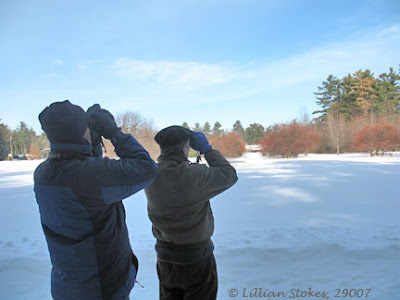 We participated in one of the southern NH Christmas Bird Count circle areas. Our team censused a section of that area; feeder watchers in our section reported their numbers to us. 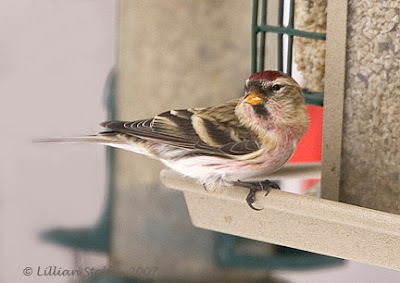 The number of Common Redpolls reported in our team's section was 140, higher than any other species' number. 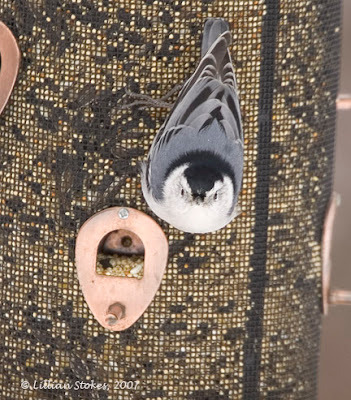 We predicted this would be a big year for "irruptive species" and were right. (left to right) Don, David, Phoebe, and Meade. Temp. 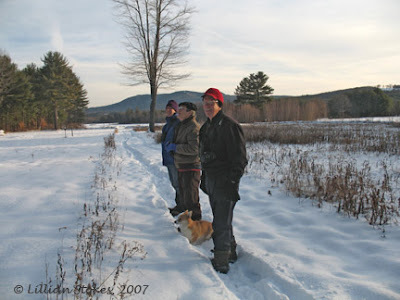 was 6 degrees as we started out on our property, searching for birds, but staying on the tamped down paths. 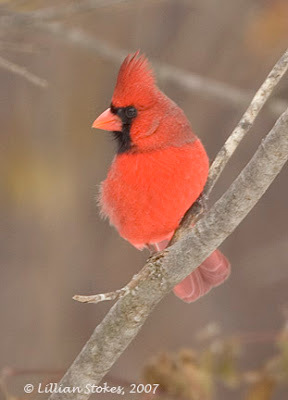 A beautiful, male Northern Cardinal came to our feeders, one of the few Cardinals seen in our team's area. 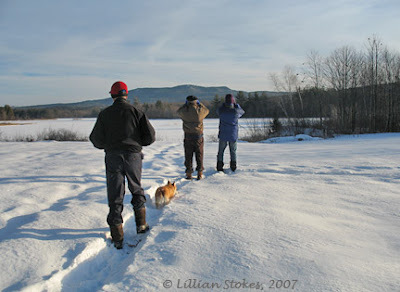 Our group continued out towards the frozen lake and spotted some Crows. Phoebe, our Corgi, walked right in our tracks. This male White-breasted Nuthatch clung to our Stokes giant combo feeder. Love the way he was looking right at me. 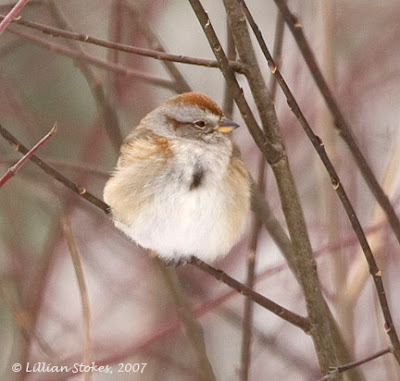 This Tree Sparrow looked like a cotton ball, all poofed out and sitting on its feet to keep warm. We found 6 Tree Sparrows on our property, more than anyone in our area reported. Guess they like us. 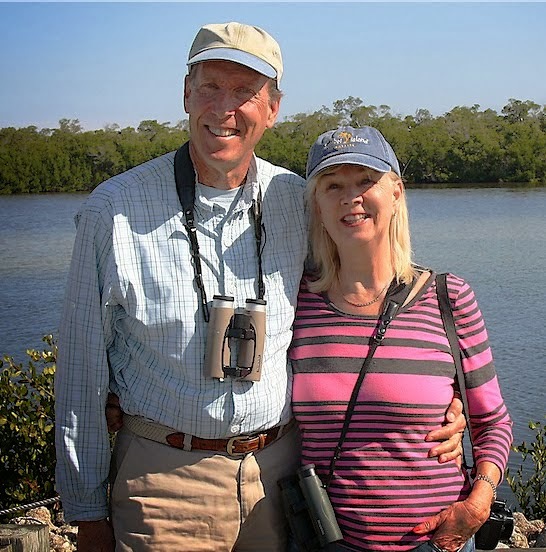 Our search consisted of driving to different neighborhoods, walking down the roads, and looking and listening for any sign of birds. 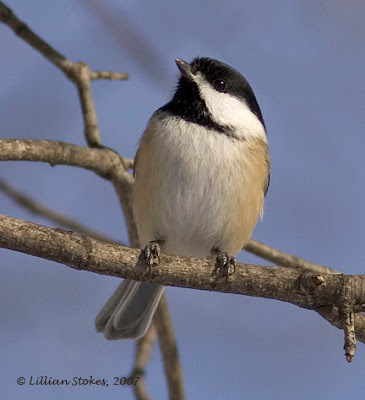 Here I spotted some Black-capped Chickadees on their way to the feeders at a nearby house. A beautiful sunny day, but bone-chilling cold. It warmed to a balmy 16 degrees in the afternoon. It always amazes me how the birds survive in this weather. who were a little skitterish. 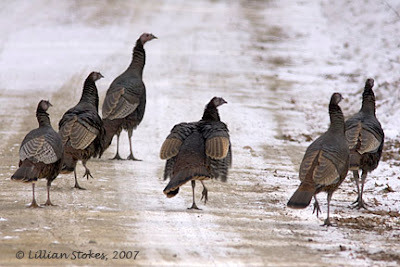 There's always something funny about the way Turkeys' large bodies hurry to catch up with alarmist thoughts in their brains. 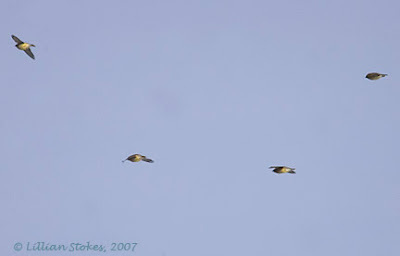 Cedar Waxwings in flight, who were there for the crabapples, their winter food. 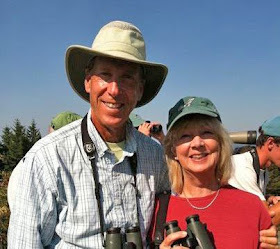 However, they technically were on the territory of another birding group, who we ran into. 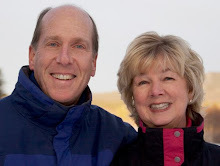 (Hi Scott and Dave, if you're reading this.) They had already seen the waxwings and will include them with their numbers. Everyone checked to see if they could spot any Bohemian Waxwings (more rare) in with the Cedars, but no luck. Onward to the feeders at an environmental center where we were greeted by a large group of Evening Grosbeaks, another "irruptive species." Something flew across the road in front of us and landed in the woods. Surprise, it was a Barred Owl! Actually, a number of Barred Owls are being seen in southern NH; the early deep snow is making it hard for them to get to the voles, their food source, down under the snow. 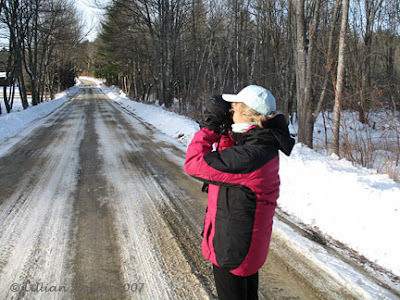 Additional info: numbers that were tallied by all the teams for the whole of the Christmas Bird Count circle we participated in, indicated record numbers of Pine Grosbeaks (262) and Common Redpolls (285) seen. To sum up our day. 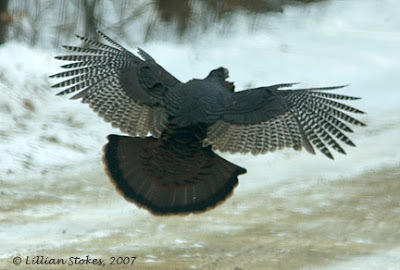 - As predicted, there will probably be record numbers of "irruptive species" tallyed. - On crabapple trees, where all the Pine Grosbeaks and Cedar Waxwings were. - There were very low numbers of Dark-eyed Juncos, American Goldfinches (only 8 from our section, none in the other sections of our count area), Robins, and many other species who, wisely, had left this area of too much winter too soon. 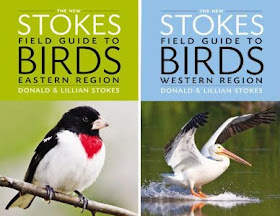 Hope they are all some place warm and sunny and hope the rest of you are enjoying your Christmas Bird Counts. Let us know what your counts were like. 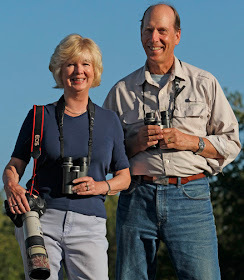 For more tips and information about Christmas Bird Counts click here. You had a wonderful time for sure and thanks for sharing your great day with everyone! It's fun to share, glad I was able to get the photos. 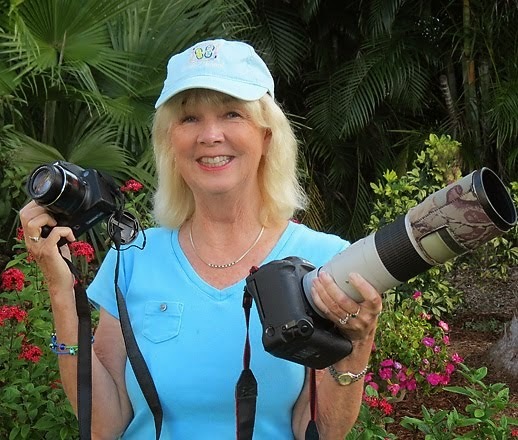 I love coming to your blog to see your bird photos. Thank you. 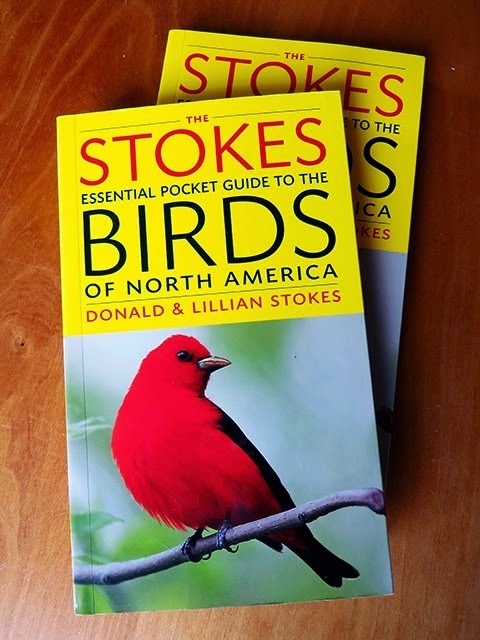 I know I'll be able to recognize a redpoll, evening grosbeak, or pine grosbeak here in Ohio the first time because I've seen your photos. 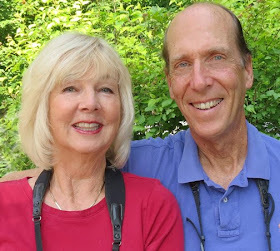 I've always enjoyed your bird call tapes and books, but didn't realize you had a blog until today. Very cool. I'm a nature photographer based out of VA, but spent the winter in upstate NY where I too was able to photograph Pine Grosbeaks (among other winter finches). 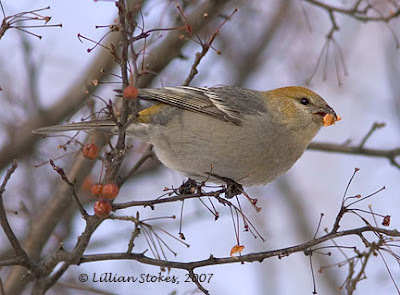 I just posted a male pine grosbeak on my blog today, actually. Anyways, if you get a chance I'd love it if you could check out my blog (http://www.chriskaylerphotography.com/blog) and perhaps leave a comment sometime. I'll definitely be stopping back in at your blog - take care and hope to hear from you soon. I just found your blog - thank you for the wonderful pictures. 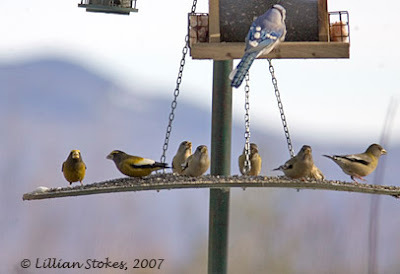 I'm watching about 30 Evening Grosbeaks on our feeders daily. 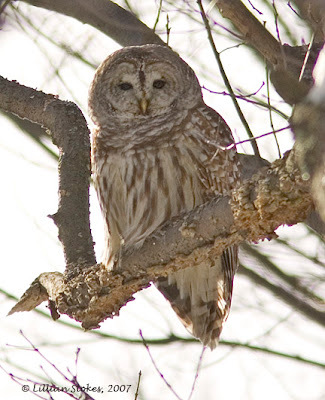 Barred Owl, "Who Cooks For You?"